We are providing gerbera basket. 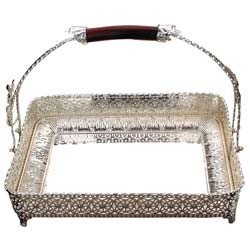 Buy Quality Gift decorating ideas directly from Signatures, Tirupur. This Tricycle Flower Basket can be used as Home, Party, Tables, Wedding Decoration and so on. Ferns N Petals brings this elegant and magnificently charming basket arrangement of 4 purple orchids, 4 pink carnations and 4 red roses with lots of arica palm leaves. This handmade basket is just the perfect to make the day for your loved one and inspire a smile on their face. This is a wonderful way to show how much you love and care for your near and dear ones. We can arrange a basket full of the most 'sweet-smelling' flowers that are also simply exquisite to look at. They're the true epitome of sheer beauty. 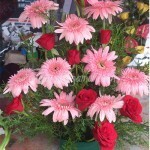 An arrangement of 24 Bright Gerbera flowers will definitely bring a glow on the receiver's face. - 24 Yellow & Red Gerberas with decorative ferns. - Arranged in a basket. Being one of the highly recognized manufacturers and supplier of Flower Bucket, we strive to bring forth the highest caliber. In terms of pricing, our offered products are fabricated at lowest production cost, and let us keep the prices comparatively low. Banking on our industrious professionals we are offering Flower Basket to our clients.